Ex-demo unit in factory carton. In close to mint condition and in full working order. It accepts both balanced analog and AES digital audio for input/output. It has 99 seconds of digital memory. Program Delay Manager (PDM) brings the possibilities of the Internet age to a “stand-alone box" technology that hasn’t advanced much since the 1980’s. Ease of use, transparent audio quality and program director friendly features converge in PDM to take an old process to a new level. Program Directors have more on their plates today than ever before. There’s no way anyone can monitor every broadcast hour of every day, but PDs need to be the first to know what happened when that “dump" button got pressed. 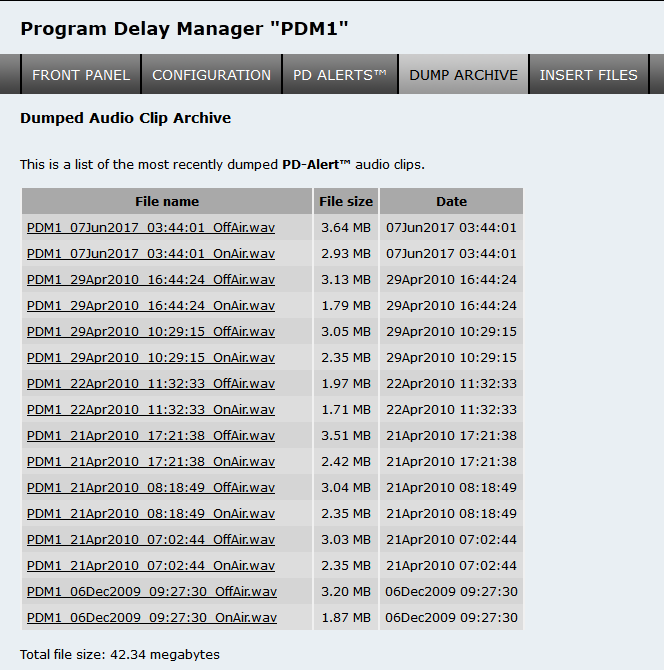 With Program Delay Manager’s patented PD-Alert feature, two time-stamped audio files capturing what took place both on air and off air get internally archived and emailed to the PD (or GM, or CE, or the legal team) every time questionable material is “dumped". For stations serious about protecting their license, PDM provides an instant log record establishing your station’s action and intent to keep the airwaves clean. PDM comes standard with 99 seconds of stereo audio delay, and a dump button that can be set to remove any number of seconds you choose. Build a delay through pre-rolling, time expansion or audio file play-out capabilities built right into PDM. Exit a delay through time compression or use the Cough button to simply wait and exit. Dump audio through the standard “cut and rebuild" method, or use PDM’s Overkill feature to play a “fill" file. Overkill allows you to select a show specific file from a list and play it over the dump buffer instead of collapsing the delay. 25-Seven has a well-deserved reputation for offering the industry’s most transparent time compression and expansion algorithms. Your listeners probably won’t appreciate our superior, artifact-free audio because they won’t perceive it’s in use! 25-Seven Systems’ imperceptible audio time compression algorithms serve up smooth, crisp, stutter- free audio in PDM, even on stereo music. Unlike other products, we never splice at level thresholds or alter pitch. Clean audio is what we do best… now you can be sure the content is “clean" as well! Better algorithms mean delays can be rebuilt faster, so you can safely get back to callers. Build or Exit rates can be adjusted in real time, so you can be more or less aggressive, depending on audio content. PAD or “now playing" data streams are delayed in precise synchronization with the audio as it grows, shrinks or whenever the dump button is pressed. PDM’s data-follow-audio capabilities allow flexible synchronization from any data input to any data output. For example, serial data entering the RS-232 input can be routed to an IP output while remaining synchronized to the audio. 2 independent data delays are supported, and GPI/O closures stay in sync, too. Superior balanced analog I/O, with AES digital standard. 85dB s/n, response 25Hz-18kHz (+0/-0.2dB) and 0.02% THD+N… even during compression/expansion. Audio is always linear, so no lossy data reduction enters your signal path. The first program delay to provide Audio over IP (AoIP) and control over Axia Livewire audio networks, PDM comes in two models: one with balanced analog and AES digital I/O and the other with AoIP for Livewire. Whether you already have a Livewire network or you want to keep your plant AoIP-capable, PDM has you covered with Ethernet connectivity. Choices, choices! PDM presents you with easy-to-use front panel controls, designed for the rigors of radio. Contact closure commands can be synced to the audio delay by the smart, programmable 8x8 GP I/O. Full bi-directional serial control over both RS232 and IP include advanced real-time status monitoring of parameters such as current delay depth and audio levels. A comprehensive web interface allows your PDM to be managed from nearly anywhere. Our Multi-View web feature permits networks and big facilities to monitor and manage up to 20 PDM’s from a single browser screen. Say goodbye to hieroglyphs. 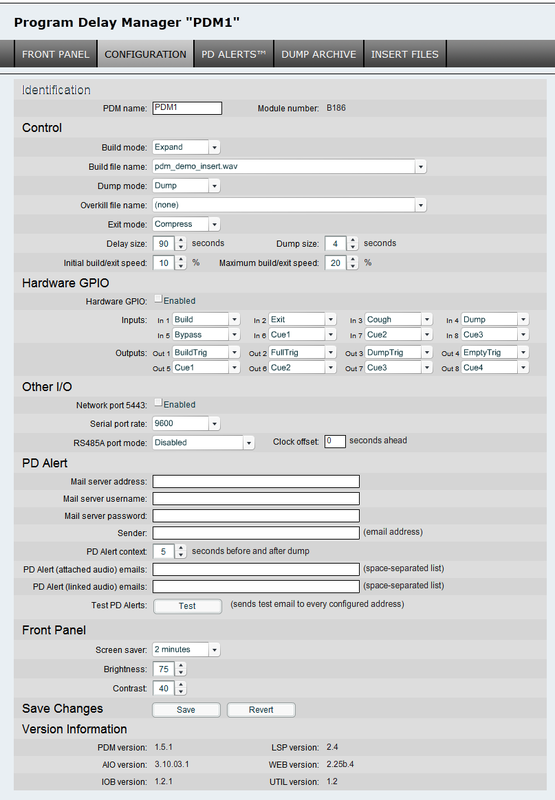 Navigating through “set and forget" parameters is a breeze with our built-in web server. Change your settings, upload audio files and manage PDM’s dump archives using simple browser screens, so you don’t waste time trying to enter data though an ill suited LCD interface. Talk to PDM over your LAN or WAN. What could be easier?